there's more time to write reports for stormcarib . - Rough seas and SNOW!!! Just having a break in the UK. 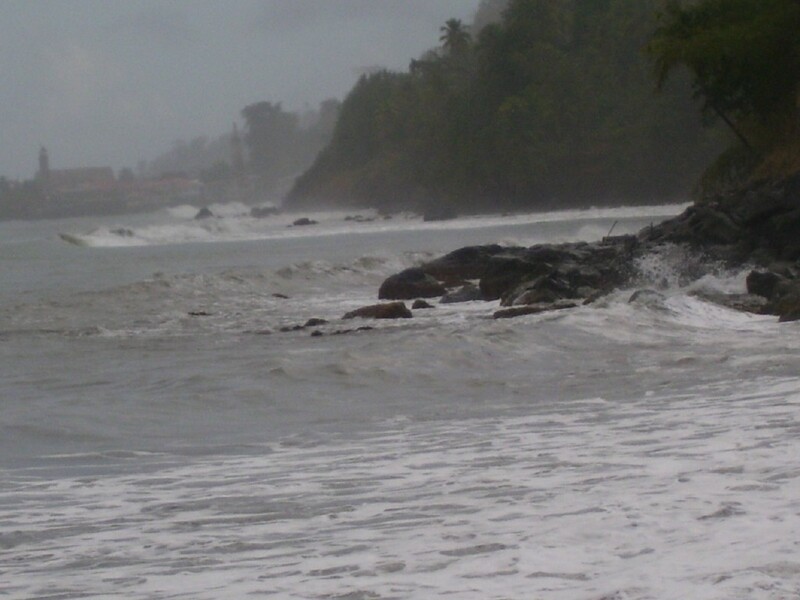 I have heard that the large waves have reached Grenada, although not as bad as further north. Hope all is OK there. Anyway, thought you might like to hear (and see) that we woke up this morning to SNOW, about 2-3 inches of it. 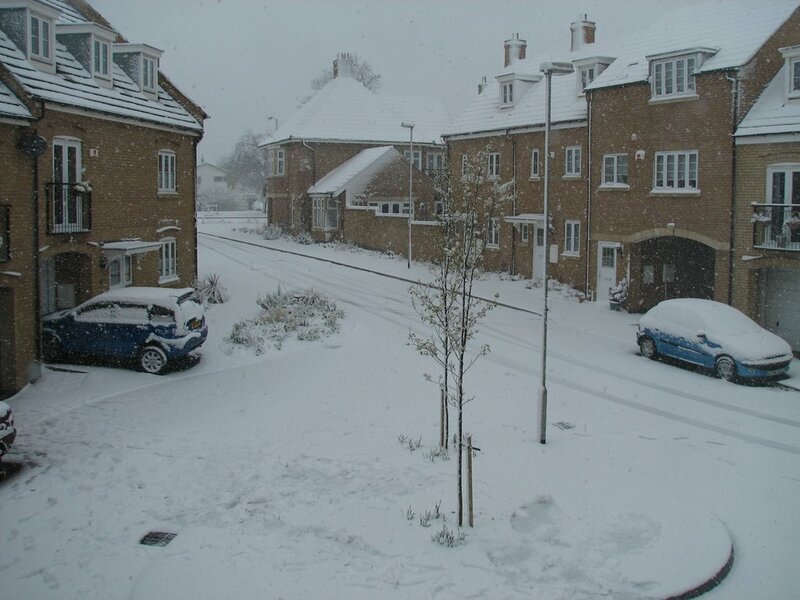 This is Easter Sunday, not Christmas day! Still it is nice to see the snow, from the comfort of a centrally heated house. I hope to be back to the warmth of Grenada soon. Get Kodak prints of this picture, and all your other favorites, at www.kodakgallery.com! Get started for free at kodakgallery.com and we'll give you 20 free prints (new members only). Plus, create photo mugs, books, cards, and more! Well after my hobby horse ride last week (talking about scrub fires). I would like to report that the plot across the road from me was burned today. Fortunately there was little wind when they started, and they had been told to start burning at the top of the hill first. Apart from suffering choking smoke and ash dropping all over the veranda, it went off without spreading. Now the plot is completely devoid of any plants and wildlife. I approached the guys that had chopped the trees down and were now doing the burning. As a part of the conversation I asked what do you do if you find 'serpents' (Grenadian name for Tree Boas, a small version of a Boa-constrictor)? They said 'Kill em' without any hesitation. I find this such a shame, especially as there is an increase in rats on the island. I tried to point out that more people have died from diseases spread by rats than have ever died from snake bites, but he replied 'don't like em, kill em'. For interest, Grenada has no poisonous snakes, a fact that does not seem to be taught in schools here. They are very slow moving, normally curled up happily in a tree doing no one any harm, unless you try to touch them, then they will defend themselves, by biting. Best left alone to do the job they are good at, killing vermin. Now I will get off hobby horse No.2, and say that we have had no rain over the last week and the dry rain forests are looking a bit more brown. The garden plants are struggling, but we have a watering 'computer' that comes on twice a day (6am & 6pm) for about 15 minutes, it waters some of our more delicate plants. It is gravity fed from our water tank, the level in which is dropping rapidly. We should have sufficient to last us through until the rain comes again. I see from one of the other island reports, that the Caribbean can expect some high waves later in the week. Apparently starting Wednesday, in the north. I don't know if this will affect the more southerly islands, but watch out. Beach picnic and a swim tomorow, looking forward to that. All the best to you all for the year ahead. - Dry Season not too bad. Well, so far, the dry season hasn't been too bad. The South of the island, the area that gets least rain, is looking reasonably green. Just slightly brownish blobs in the coastal forest areas. But still a couple of months to go. We have had rain most nights (except the last two). Unfortunately this hasn't dampened down the scrub enough to stop some local scrub clearance fires (preparing to build) getting out of control. We had a fire engine up and down all day trying to put one out. I am afraid people don't consider the consequences when they set it alight. There is another area closer to us that will be burned this coming week. The strong winds just fan the flames. If the land owners were sent the bill for this thoughtless act, maybe it wouldn't happen so much. Also, why do people have to chop everything down on a plot? In amongst the scrub and forest are some very nice trees that would give shade. Shade means cooler. The excessive heat after Ivan was due to lack of shade, not higher air temperatures. Also trees give homes for wildlife, birds, lizards, etc. Does the human race have to destroy everything? Trees also convert Carbondioxide to Oxygen. We should all try to do a little to help. Sorry if this all sounds a little environmentalist, but it does have a knock on affect to the weather, and thus storms. All the best to all of you for the coming season. - Gardening in Grenada in the dry season! Hello all that read this post. Weatherwise, there is very little to say, The thing that tells me that we are in the dry season is the water tank has dropped by a couple of thousand gallons. This means we are using it faster than any rain is replenishing it. Infact we have had a fair few light showers which are helping to keep everything green. 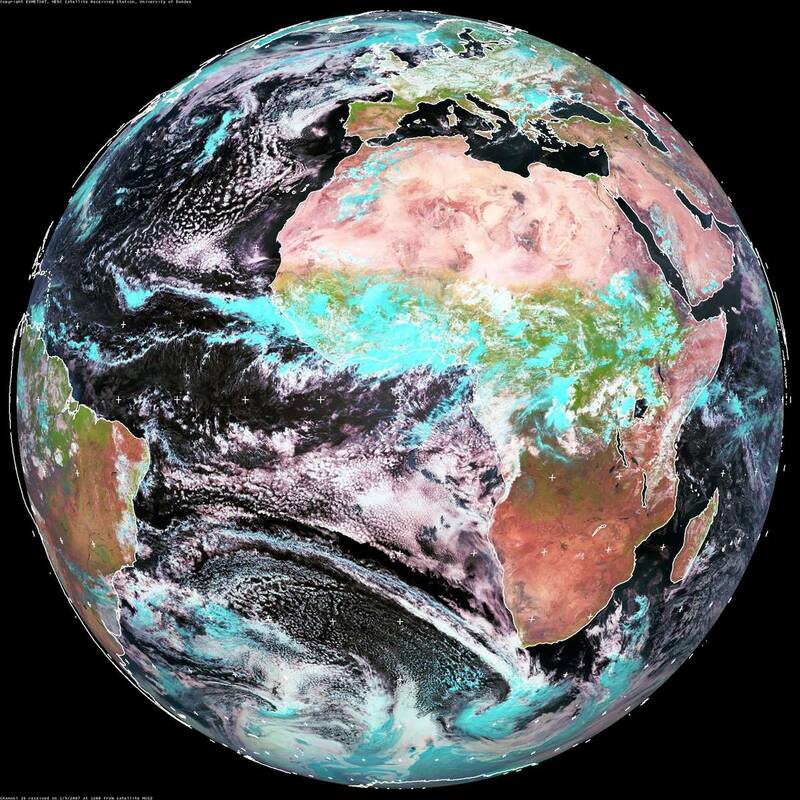 Looking at the satelite images, we are in that NE stream of low fluffy clouds that extend right across the Atlantic. We are in that steady NE trade winds that keep our bedrooms fairly cool at night (one night about 3 days ago, it felt cold). We are doing a major change of one of our flowerbeds. Since we moved in 3 years + ago this bit of garden has been waiting. It did have plants, but they have been struggling to survive in, mostly, builders rubble and subsoil. So after some major retaining wall work we have removed the worst of the soil and replaced with better soil, built a path over waste pipes, and moved all the plants! The connection this has with the weather is that we are pleased with the small showers we are getting, to help reroot the plants. The watering is helped by a watering computer that comes on automatically for 10 mins twice a day. Some of the plants that really looked as if they wouldn't survive we hacked down drastically, so they didn't loose so much water, this seems to be working. for a lovely view of Grenada from just off the west coast. All the best for the comming season. Good morning to all you wonderful people on the Storm Carib web site. Miss Mermaid, I too have a fussy cat who only eats biscuits and they have to be fresh and crunchy...... the dogs get the ones he has left to get soft. We have at last had a break in the wet and windy weather and have had a couple of good days, today looks as though it will be bright and sunny too. I was beginning to think the Christmas breeze had had a memory lapse and thought it was still 'that' season but hopefully it has got it right now and we will have a dry (ahemmmm not too dry!!) Christmas. I love the cooler nights at this time of year when you can actually pull up the duvet cover (obviously an empty one) and cuddle up. I would like to wish all the Correspondents a Happy, Healthy and Merry Christmas and may your New Year be peaceful and calm. It may be a bit brighter today but the wind has not stopped all night and neither the noise from my neighbour's shed roof!!! Yesterday morning a second of the roof blew off (it was the wind that did it!) and for the rest of the day and night I could keep hearing that awful sound of rattling galvanise.... memories I could do without at this time of year. Every now and then a huge gust blows up the valley and the fact that I am surrounded by bush, banana, fruit and just about any other tree does not help with the noise.... and of course this one neighbour and his galvanise!! Point Salines is posting winds of 21kt, but the gusts seem quite a bit stronger than that. The weather this morning was very reminiscent of Felix this summer....the rain has been strong enough to white-out visibility at the end of our back yard, and our concrete house has sprung three leaks! I have great sympathy for persons living in poorly built homes this morning, particularly if they haven't got internet at home to relay their concerns about what kind of weather we're having......as there is no 'weather' channel for us to rely on to explain what is being experienced on the ground. - I'd like to give this weather a name!! Morning Folks..... and by no means a good one!!! Wow where did this come from? We've rain and wind most of the night and this morning you would think it was still Hurricane Season and we were experiencing a Tropical Storm.... really big gusts up here in Mt. Moritz. My sister just phoned to tell me she has been awake since 3 am frightened we were getting a bad storm. I don't think I'll go to town today, my dogs would never forgive me if I put them out in this weather; they are all cozy and comfy indoors and deliberately not looking at me in case I put them out... bills can wait another day! I was going to write how lovely the weather had been, beautiful sunshine in the day and cool at night but this morning I even have my veranda doors shut which is virtually unheard of. - Weather layer on Google Earth. Not much to say about the weather in Grenada. Seems pretty normal for the time of year. A few occasional showers, mostly overnight. Not much breeze for a couple of days, and pleasant temperatures overnight. As it is weather related, thought I might point out Google Earth now has a weather layer. This shows the cloud systems around the globe, in almost real-time. Also the temperatures if you zoom in to an area. Click on the weather icon and get more info, including forecasts, in some areas. Not weather related, but interesting, is the Geographic web layer that shows photos taken of an area. As you zoom in, you will see blue dots appear (if you have geographic web layer on). Closer in they turn to camera icons. Click on these to see photos taken (supposedly) from that spot. Click on the photo to get further info about the photo and to see others in the area that are not yet on Google Earth. And,yes you will find some of my photos if you look around Grenada. Wishing you all seasons greetings and calm weather for next year. Well that was my first experience of a quake. I believe the slow rocking motion was due the the depth of the epicentre (90 miles). Having been working hard, I thought I would sit for a while. When I first felt the mopement I thought it was me. Then the security grills started rattlng. The strangest thing was the sound of sploshing water coming from the water tank, followed by it overflowing! The movement here in Grenada was a kind of gentle rocking, nothing violent. Just imagine the energy required to move all these islands by that amount! Glad to hear all seems OK around the islands, only slight damage. OK I'm feeling silly now having read the message from Gert about the earthquake and Miss Mermaid's account.... note to self.... read messages first!! I'm also feeling silly because my house guest (who used to live in California) calmly said "That's nothing".... I bet it wasn't nothing for those closer. - Who Felt the Earth Move? So where was the Earthquake? This was a first for me, feeling the whole house move..... apart from that the day has been glorious here. I think a nice cooling late afternoon swim is in order. - Three days of overcast and a lot of rain. Today has been fine, a stiff breeze, sunshine and no rain. But the three previous days Gave us lots of rain. Enough to fill, and a lot more, the water tank. I was interested to hear just how much rain we had, but I believe Mark had some problems with his rain gauge, so we will never know! All now very quiet, lets hope it stays that way. 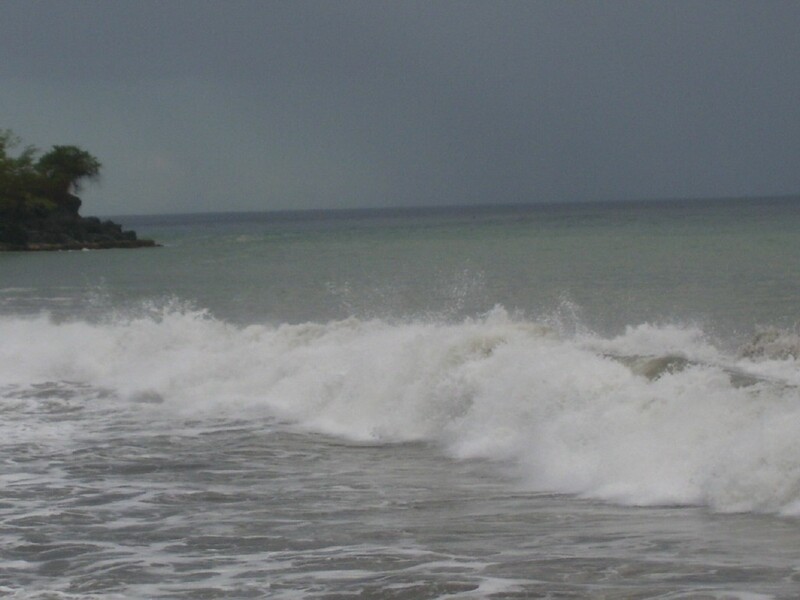 - At last the rainy season hits Grenada. Thanks Mark, for the rain figures yesterday. 2.5 inches. Well the rain eased off by mid morning, just leaving a high overcast sky, most of the day. 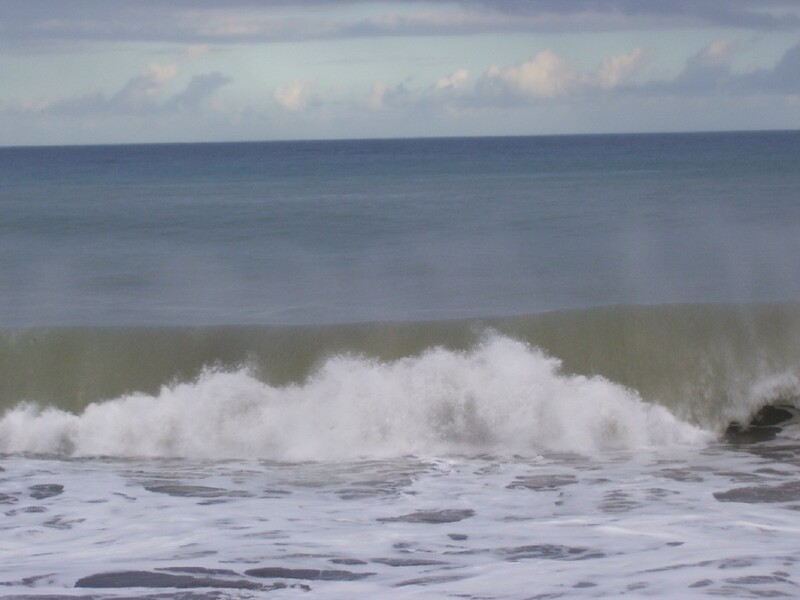 But early this morning the rain came, at first in waves, but now it is continuous. At long last, looking at the satelite pictures, Grenada is no longer in a rain/cloud void. In fact it is difficult to find us under the pretty colours. We won't have to water the plants for at least a few days now. Mark, maybe you can give us the figures for today, if the rain stops long enough for you to check it? Last night the latest tropical wave brought fantastic lightning shows and 2.5" rain so far to Grenada, and this morning it's still raining. Certainly a welcome change after the very dry period we have had recently. Today is a sit at home with a warm cup of tea kind of day. - Where have all the Flowers gone or Feed Me!! Well we do still have flowers but they are screaming for water.....So sorry Hogan I would share if I could. This is more like dry season with the rain waking me this morning (it must have been singing happy birthday) but you would never guess we had had rain now. So pleased we didn't plant cabbage this year. With the relative inactivity of storms it is easy to get complacent and as Gert said we have a while to go yet.... talk about wishing your life away and with another birthday under my belt I realise how quickly time goes by. So extra supplies are still there, candles etc at the ready but I so hope they will still be there at Christmas. That is what my wife said as we were woken up abruptly, in the middle of the night. There was this strange loud noise on the roof. It was rain, very heavy rain. And it lasted for several minutes. My immediate thought was - ah we don't have to water the plants today. This morning the outside tiles are dry, but the ground is still wet, and the air smells somewhat fresher. Looking out at our almost 360 degree view, I see probably more fluffy clouds than I have for quite a while, but no sign of any more showers. I do hope we get some more! 91L predictions are for it to go North and miss the islands. The experts have been pretty acurate, this year. Lets hope they are correct this time. I would ask for some rain from it, but I guess if we get any, it will fall on poor old Dominica again, and bot down here. - It just goes to show. Jacquie, says she had some nice rain today. This is the localised weather in Grenada again. Here in Westerhall area, we have had none to talk about since my last post saying the weather had changed and that was over a week ago. We are so dry here in the south it is unbelievable. Can we have some of your water for our plants, Jacquie? A nice amount of rain this morning so the plants are looking happier, the air is fresher with a nice breeze and now the sun is shining and the sky is blue. All is well with the world. Yesterday the weather was how I would expect it at this time of year. From our vantage point, we could see many showers in all directions. We also received a few ourselves. Nice to hear the rain on the roof again. It will take a lot to fill the tank though. Today - I can see one shower that appears to be coming in our direction, and the sky looks promising for another Caribbean wet season day - Sun & Showers. That would be nice. Unfortunately the breeze has dropped somewhat. I see that the African Wave has now been designated as disturbance 99L and it appears to have a spin. It is at 14N 25.5W on the last satellite picture from http://www.nrlmry.navy.mil/tc_pages/tc_home.html . I will be keeping an eye on this one. Karen took (or was adjusted) a turn WSW overnight. This didn't look good on the graph I do, but all the predictions are still for it to go N. of the islands, and to weeken for the next couple of days. Before the adjustment it was following the course of Frances 2004, now it has dropped below it. It is about 60 Nautical Miles north of the track of Dean at this Longitude. Lets hope the experts are correct in their predictions. Since I started this post the shower that was heading our way is getting closer. Hope we get it. Rain, rain, wonderful rain, we have it in plenty today, it is so much cooler, have been walking in it and dancing in it. After such a fabulous moon last night, it was a perfect day, we need it for the crops and for my sanity, it was tooooooooooooo hot. Briefly, The weather here is back to what seems like normal.A breeze, towering clouds, some rain playing with the island (not much) and the odd rumble of thunder. This evening brought the sight of lighning and distant rumbles of thunder. There was a brief display, this evening, of what I call 'light house lightning', it appears to come from what seems to be a relatively small cloud and, for a while, seems to flash regularly and frequently and always in the same spot, but never to the ground. The actual lightning is never visible just part of the cloud lights up. I have seen this happen on a few occasions since I have been in Grenada, but have never seen it in the UK. I am assuming it occurs in the thin tall clouds. I would be interested in anyones explanation. But for now my eyes are looking East. - Looks like the rain has passed us by again. With 97L travelling north and giving more rain to Martinique and islands nearby, here in Grenada, nothing, not a hint of rain. Not a hint of wind. I have seen the sea here calm before, but I don't think I have seen it quite this calm. It is still hazy though. and the calm sea just blends in with the hazy sky, quite weird. Tried to take a photo, but there is nothing to see really. My wife is out watering plants. All the cuttings that we took a few weeks ago, that were shooting, have now died. Just hoping the tail of 97L gives us some rain. Monday morning: There is a hazy sun and no breeze. The sky is a hazy blue. There are very few low clouds visible, but due to the haze I can't see very far. There is no horizon, Point Saline airport give visibility to be greater than 7 miles (I would say not much greater). We now wait to see what, if anything, 97L brings - later today. It seems to have slowed a little. All the paths show it going north of Grenada. It doesn't look very organised, but hopefully we might get some rain. - 96L compared to Ivan. I hadn't noticed 96L when I sent the previous posts, here are a few facts and figures. 96L is currently at just above 6 degrees N. This is 3 degress below where Ivan started. Thats about 180 Nautical Miles. Ivan started at 9.7N 27.6W as a Tropical Depression. It dropped to 8.9N at it's lowest, that was when it reached about 37W. I have looked back over the last ten years and there are no Atlantic named storms starting this near the equator. In fact no where near it. If this develops it is in new territory. Global Warming? As for Grenada this afternoon. Yes it is hot, hardly any breeze. The only difference is we can't see the horizon today. It is very hazy. Humidity is not particularly high (about 64). There are a few clouds above the hills, but not enough for rain. But I sense a change. We (our gardens) need rain. - 97L - I forgot to mention! Sorry, I forgot to say in my previous post. All of the predictions for 97L show it going further North. Currently most show it going towards St Lucia, Martinique area. But Ivan and I beleive Emily were given tracks further North than the ones they finally followed. 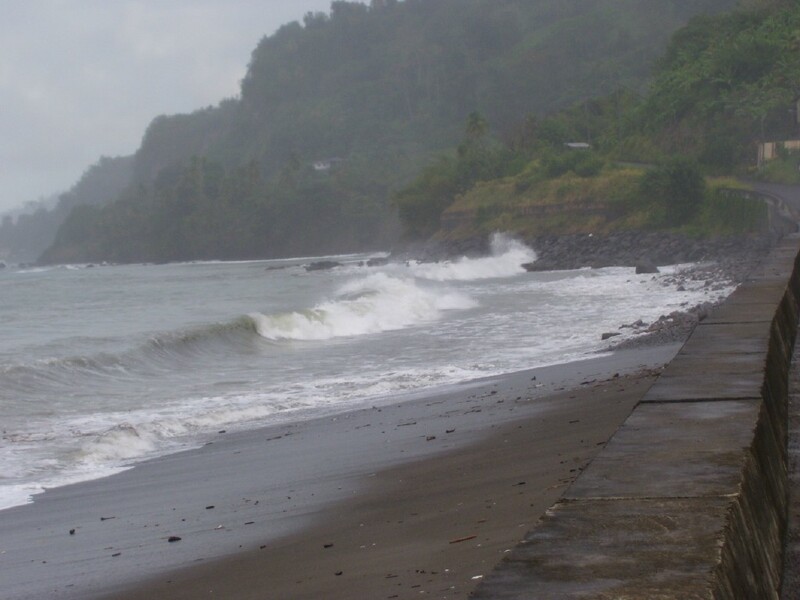 I hope for Martinique, ST Lucia, and Dominica, they don't get any more bad weather. - 97L 600 miles to the East. Grenada starts the day with hardly a cloud in the sky. Yesterday there was a brief shower early morning, but it didn't even wet the ground here in Westerhall. Today looks like another hot,dry day. But I see we have a disturbance, 97L , about 600 miles east of us. It is developing from one of the waves that has been moving westward across the Atlantic for the last week. It is currently where Ivan was 30 hours before hitting Grenada, it was a Cat 2 at this point, and Emily was 36 hours before coming through Grenada it was a tropical storm at this point. Earl (2004) became a tropical storm almost at this spot, but fortunately never developed past TS status, it went through Grenada about 24 hours later and then fizzled out. So based on the above and with no expertise whatsoever, it looks like we could have a spot of weather within the next couple of days. Hopefully just some rain. So my eyes are looking East. Hi all, I am struggling to find a weather related topic, it is Hot, but at least there is a breeze now. Today we had part of our roof removed, not by a hurricane, but by roofers, because the original building contractor (who was sacked for other reasons) didn't strengthen it enough! It has cost us to strengthen it, but I now feel happier. Ivan removed some of the roof, which brought to life that the perlins (hope that is the spelling), things that hold the roof material on, were 30 inches apart rather than the recomended 24 inches. Having taken another section off that has been rattling since Ivan, we found it was 36!!!! inches between perlins, instead of 24 inches, recommended by the roofer! I am only saying this, on this web site to warn people building in the Caribbean, to check on the recommendations on house construction. We can't guarantee that you won't get damage in a Cat 4/5 like Ivan, but do your best to make it as strong as possible. We were novices here, and believed we had a good builder. WE didn't! So, look up the regulations on the internet and don't be frightend to question your builder. By the way, I was helping on the roof, today and it was hot, despite the breeze. And fortunately there was no rain, but that is not a surprise in Grenada at the moment - although there was a swift shower in Grande Anse yesterday afternoon. We had a pleasant evening, BBQ at Aubreys, pleasant company. Must do this more Fridays! Not much else to say about the weather really, other than 'what rainy season'? Keep counting down the days in September. From Hogan who feels happier about his roof today! No gusts now..... not a breathe of breeze, nothing stirring and as others have said so, so hot. The garden is beginning to look like it does in the dry season; plant wilting from lack of water, crying.... feed me, feed me. I sound as though I am never happy with the weather; either too windy or not windy enough but a nice gentle trade wind would be lovely right now. It is so HOT here in Grenada, I went up country yesterday and everyone talking about the heat and how its not usually like this in September. We are having the most gorgeous sunsets, sun red, red, red, sinking into the sea every night a good sign according to folklore. Fluffy pink clouds floating on the horizon as the sun goes down over St George harbour, music plays in the market, we are enjoying. - What a day, and evening. Well the day continued as it began. Virtually cloudless, no wind, and definitely no rain. Here are 4 photos I took today. Look at those skies. Still calm as I go to bed. - Hot, No breeze, No rain. Having seen the post from Jacquie, I have to be careful to say that my weather reports are from the south coast of Grenada, which does have a different localized climate from other areas of Grenada. The trade winds (when they are blowing) have no large mountains to hit before us, therefore we tend to get less rain, less clouds, but generally we get a stiff breeze. My guess is that the gusty winds they were experiencing, in Mount Morris, about the time of my report is more an affect of the mountains, being Mt Morris is in the shade of some very high hills, just in from the west coast, a couple of miles North of St Georges. Back to today, and as per the subject, It is hot, there is virtually no breeze, and we have had little rain for probably about a week now. I am talking about the south coast, as we did hear some thunder in the mountains during the week, so I wouldn't be surprised if they had some rain there. Most reports seem to show Ingrid fizzling out. I do hope so for all of those in the Northern isles and beyond. But for now, just a little rain would do the plants very well indeed. In the few minutes since I started this post, the breeze has picked up a little. Not sure about the pleasant breeze Hogan, up here in Mt. Moritz it is gusting big enough to have my dogs running for cover... then it dies to almost nothing and up it comes again. It is still hazy with no clear horizon and a few white clouds but a lot brighter than yesterday. It was a very windy night last night and seems to be continuing today, although a lot of trees are growing up again we lost a great many up here (from Ivan) that formed a windbreak for us. Mostly the breeze is welcome but these gusts always make me and of course the dogs, nervous particularly at this time of year. - 91L now North of the path of Dean. Grenada this morning is very pleasant, but hazy. There is no clear horizon. A pleasant breeze. The satelite picture of this area shows no areas of heavy cloud nearby, maybe we will have a good day. Yesterday was dull and overcast, but very little rain, more like a miserable November day in the UK (except for the temperature). Looking at the various reports it seems that 91L has now moved north of where Dean was at this longitude. Also by now Dean was already a tropical storm. Yesterday I was wishing it would go more north, as was predicted, it seems to be following my wish (and I am sure many others). I wanted it go up in the Atlantic away from us in the Caribbean. Sorry Bermuda, I forgot the small dot in the middle of the Atlantic. There is plenty of ocean up your way for it to get lost in though. People are biting their nails again in Grenada, we are extremely hot and overcast and being warned that there is another system building up in the Atlantic about 900 miles out. "This time I will be prepared" is on everyone's lips. We were extremely prepared for Felix and we hope that this one will again be a false alarm for us, I dont think we could cope with the aftermath of Ivan again. The roofs that were damaged in Ivan havent been all repaired yet let alone the roofs from Felix so we continue to keep a weather eye out. - Strange weather yesterday evening! Good morning from a completely overcast Grenada. Breezy but generally no rain. The current saterlite pictures show us under a blob similar to Dominica yesterday, but the conditions are completely different (so far). Yesterday afternoon was strange, we were just finishing some cement rendering on an ouside wall, when we noticed some huge towering clouds coming in from the SE. The cloud tops were beaufifully white, but underneath was black. The horizon disappeared. We decided to cover the wall as the rendering was still 'green'. The clouds arrived, but there was only a very small amount of fine rain (although some areas nearby had a heavier short lived burst). The strange thing was the drop in temperature. from 86F (30C) to 77F (25C) in a very short time, it felt cold, also a strong wind picked up. I noticed that Point Saline airport registered wind speed 17 MPH with a gust of 52 MPH!!!! Not sure that was accurate, but the sea was really chopped up. By 9PM the temperature had risen to 82F(28C). Watching 91L, we don't want it, but we don't wish any more storms on anyone else either. 91L GO NORTH, VERY NORTH, up into the Atlantic, where most storms used to go before Ivan*. There are no big gaps between the islands, well not big enough for a hurricane to slip through without causing damage, as we saw with Dean. When it gets through it is trapped and, unless it fizzles out, it is going to get someone. Just change the year in the web address for other years. If 91L wants to do anything, then it should learn from Nicholas 2003. Enough gibberish from me for today. As 'StormTracker' suggested, I have checked out 91L, And I have found that 91L is in the corridor of Ivan, Emily and Felix. 91L is about 30 miles North of where Ivan was at this point in the Atlantic. It is about 120 miles South of where Dean was. Ivan was a 997Mb tropical storm by this time, and 91L is still 1010Mb. But Ivan soared to Cat 4 in just 2 days from this point, it then dropped in power before picking up again, before hitting Grenada. It hasn't yet reached where Felix and Emily became Tropical Depression, but is exactly on course. One of the experts said yesterday, that it might be pulled North by a depression in the N. Atlantic, well there is no sign of that happening, yet. 91L appears to be following the new trend of just ploughing west. I am just going to double check supplies! I am waiting to hear from the experts what they feel will happen? Apart from that, it is a beautiful morning here in Grenada, but not sufficient breeze. I think it is going to be hot! Check out that wave in the mid-atlantic.....dropping central pressure, moist air, warm water, favourable upper level winds, and some beefy looking rotation on the satellite. 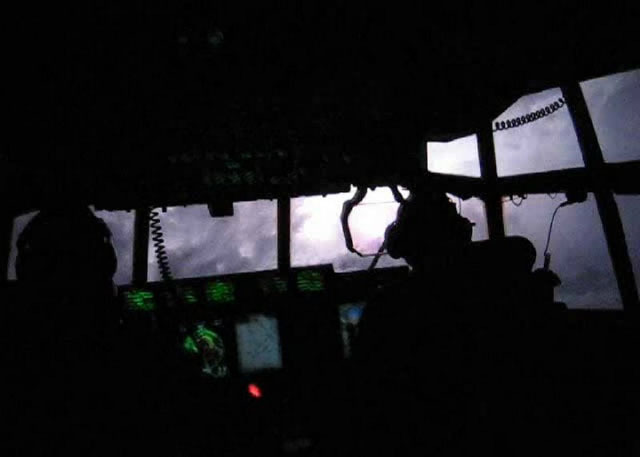 On this link there is a 7 min video of hurricane hunter C130 flying into the eye of FELIX at 2.00 am on Sept 3rd . This was the mission that flew immediately after the abandoned N42RF flight where the aircraft encountered severe turbulence. My admiration for the crew who fly these aircraft on these missions is huge. 5 hurricane hunter aircraft have been lost on such missions and Dr Jeff Masters (Weather Underground) nearly lost his life in HUGO when the aircraft they were flying in was damaged and lost one engine traversing the eye. In this video the shots of the moon in the eye are quite amazing!! Here is the link. - Penny's comment on CNN abuse. I have read Penny's comments on CNN abuse, and emailed CNN. Three years ago we had Ivan, which did destroy Grenada. I was in the UK when it struck, so was obviously glued to the news programs. I heard about the destruction, yet the images that were transmitted were from a car driving around the Lagoon and Grand Anse road. What they showed were the old wreck of a ship - which had half sunk in the harbour years ago. The remains of the old hotel on the hill over looking the bay - This had been derelict for years (I believe it had been bombed by the Americans during the time of the coup). And a house along Grand Anse that had appeared in a state of severe decay for years. Most people watching would have thought the damage to all three was due to Ivan, most of it wasn't. About 2 years later, a travel statement made by the US said (I can't remember the exact figure) that Grenada was stilll 90% destroyed. This was very much not the case, from a tourist point of view. By that time most hotels were up and running and most houses were looking fine. There were still large numbers of people who had lost their home and many of the crops will take years to come back. But this would not have affected the tourists, which the country needed badly. So Media and governments should be very careful what they say. For new tourists coming to Grenada now, they would not know there had been a huricane (sorry two) pass through unless the damage was pointed out to them. I have requested CNN put out a correction to their statement. For interest, this web site does a lot of good, tomorrow a couple are coming from the UK to Grenada to go diving. They found this website and sent emails to some of us asking what the weather was really like in the Caribbean at this time of the year. I told them and they are coming. I wish them some good diving in Carriacou. I share my shock and dismay to hear that there were (and probably still are) vessels and souls in distress who were still at sea during in the areas where FELIX made landfall – a terrible thing for all those concerned – those of us who choose to live on boats (but for luck and the grace of god) it could have been any one of us making the distress calls. 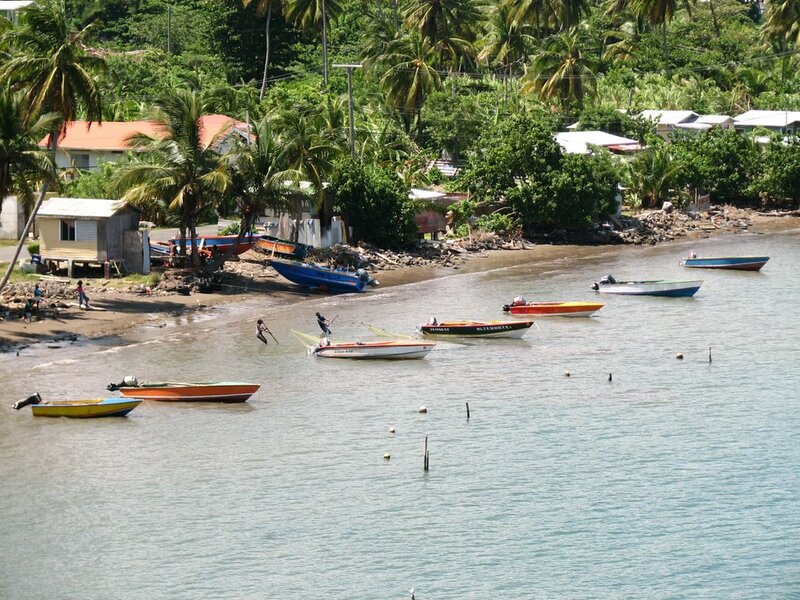 Here is a picture of peaceful Grenada and peaceful True Blue Bay today and as we generally know it – may it always remain so. Penny Leigh, Thank you for that detailed pre-huricane report. You must have been shut up in your shop with nothing left to do. All I can say is I hope you come through this OK. We look forward to hearing from you when it has passed. All the very best wishes from Grenada. Here in Grenada, very calm, the trade winds have gone again. A clear sunset last nght and a pleasant sunrise this morning. 98L seems to have dispersed. What ever it was in the Atlantic that gobbled up 98L, I hope it stays there for the rest of the season.Another few days of calm weather ahead, each one nibbling away into the H. season, but still a long way to go! Strange how we wish a good part of the year away! The 3 trees, which had fallen over in TS Felix, I have managed to strap back almost vertical. Two of them were bought by friends/visitors as gifts, the other was an Almond tree that gives good shade. I guess they will need strapping for a couple of years to get their roots strong again. Grenlec have replace the broken meter. I chopped down some other fallen trees, making way for more fruit trees. So we are now fine. Our thoughts are with all in the path of Felix. We wish you all the best. My heart goes out to all those in the path of this monster, you are all in my thoughts and I'm sure in the thoughts of the entire Caribbean..... stay safe and may your God be with you. On behalf of Mark and Chris (my partner) I wanted to post a thank you to John for assisting with the boat rescue at True Blue this morning! Chris was full of stories when he returned home around mid-day. It was a treat to come and check our virtual hurricane neighbourhood and see the photographs of his stories posted there! One for the album....that's for sure. Other Felix related comments stem from observing the incredible vulnerability of storms that can strengthen with people underneath them. We've been lucky so far (this season, as I have vivid memories of Emily in Carriacou). Once the power is out, and the radio stations are down, it's hard to know what is going on: Is it a storm, a hurricane, where is it passing, has the eye gone by, how much longer will it take...etc. These are questions everyone wants to know, and when our power went out I was dutifully listening to the only radio station I could find.....and there wasn't any mention of weather on it. The Cable and Wireless NaDMA alerts on the cell phones were very well deployed, and I heard a lot of comments from people today remarking on how useful they were, and how impressed they were about how quickly NaDMA jumped into action. I think it'd be great to get those cell phone updates more often, with information about wind speed, location, and central pressure. After dodging the Felix bullet we look East to the 1009mb low, which may be high for Grenada's interest just now, but only time will tell us if this new system decides to travel the ITCZ or go it on it's own along the 1016 ridge. TS FELIX has just been upgraded to Hurricane FELIX by NOAA – I post the advisory 5A in full. CLOSELY MONITOR THE PROGRESS OF THIS SYSTEM. 270 MILES...435 KM...EAST OF ARUBA. GENERAL MOTION IS EXPECTED TO CONTINUE DURING THE NEXT 24 HOURS. EXPECTED DURING THE NEXT 24 HOURS. TOWARD...WEST NEAR 18 MPH. MAXIMUM SUSTAINED WINDS...70 MPH. HURRICANE CENTER AT 1100 PM AST. At least 3 of our trees (non fruiting) are at most perculiar angles. Many limes have been removed from our lime trees. Funnily our banana plants seem to survive! One electricty meter, glass cover smashed. Now covered with plastic shopping bags. I guess repairing my meter is low priority for Grenlec. I have power so that is all that matters. Power returned at some point about midday, not sure when as I was running off generator. Damage elsewhere seem mild, a couple of telephone cables across the road and a few rock falls. All the inlets on the South Coast are brown from run off. Interesting to see that water running off from areas of vegetation appears clear, water coming off where there is construction taking place is brown. It looks like the damage being done to the reefs from dirty run off is mostly man made! See photos attached. You have been sent 2 pictures. I note on the camera that my partner Ann Louise did in fact get a couple of shots of me in our RIB tender as we pulled a 45 ft yacht off the pontoon at True Blue Bay during TS FELIX early this morning. 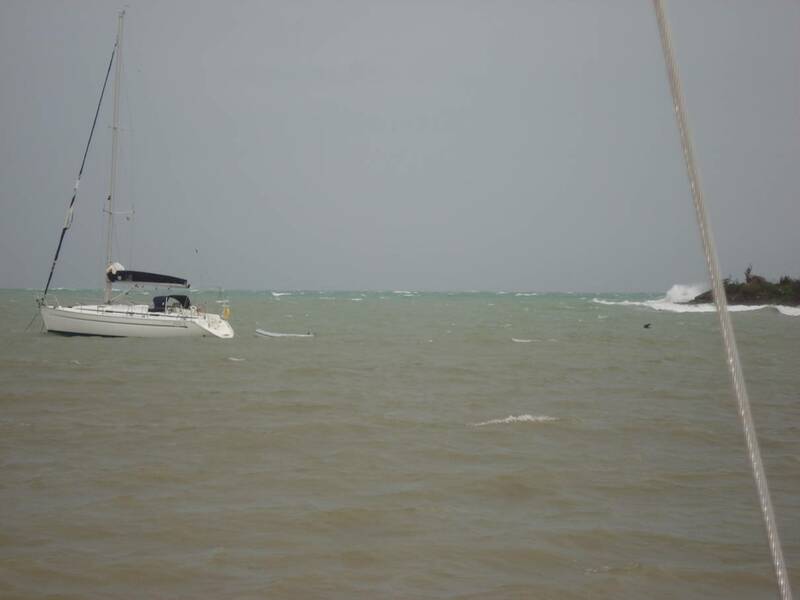 The yacht had broken free of its hurricane mooring and came to rest hard up against the floating pontoon – in some of the swells and gusts we were getting it is slightly amazing that the yacht did not get badly damaged. 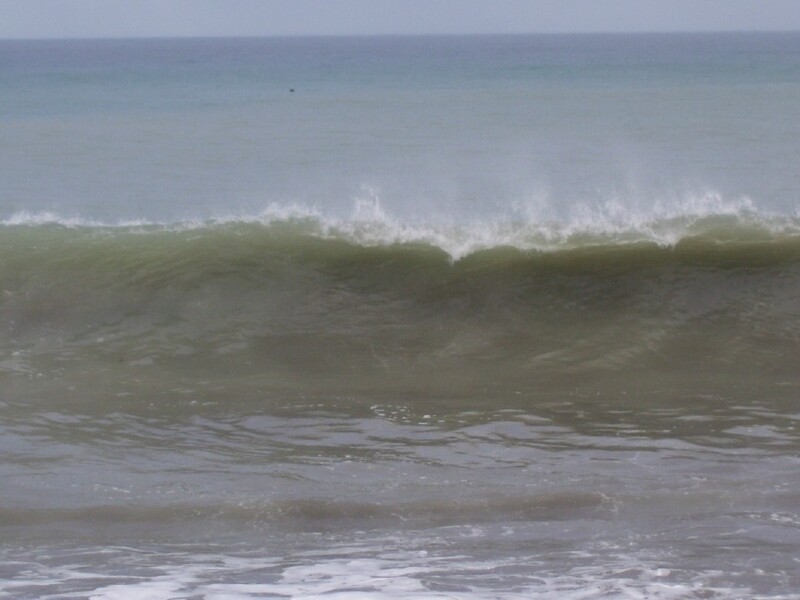 I did however manage at one stage to completely fill my RIB with a wave giving Dwayne a pretty decent pool to swim in!! evening th little ravine next side the road. This is a storm; but it feels like a category one hurricane. Spare a though for unlucky JOHN on holiday here in Grenada, over from the USA with his wife. 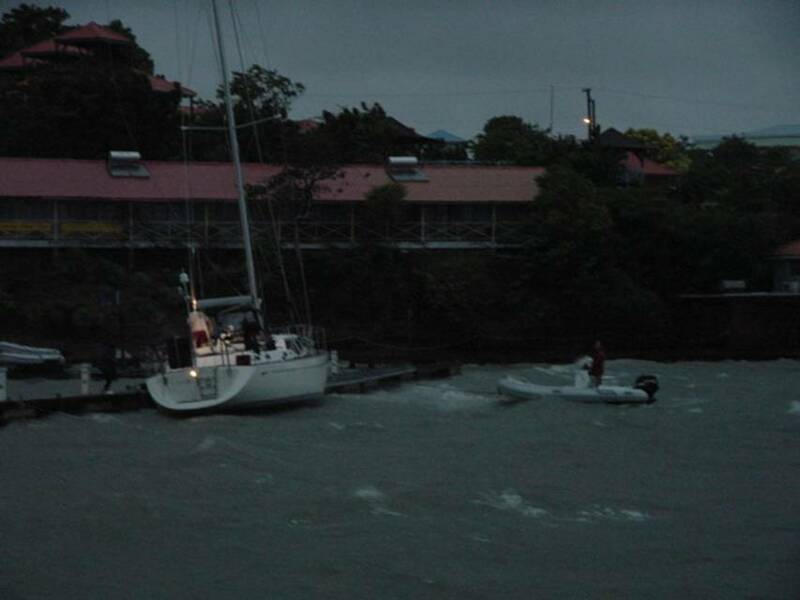 He is hunkered down on this yacht here riding out the aftermath of TS FELIX in True Blue Bay, GRENADA. He had a horrible night where his canvas biminis had to all come down in big winds and rain and then his foresail started to unravel in 50 kts this morning. I have been over to see him a couple of times in my dinghy and although he is still amazingly cheerful he actually would rather be sailing in blue seas and trade-wind conditions! This is currently True BROWN Bay! We still have 20- 25kts (gusts up to 30 occasionally) but the direction is has moved more easterly affording the bay a bit more protection now. In this clear satellite picture you can see TS FELIX spinning off Grenada (where we currently are!) and progressing west over the northern part of S America towards the outlying islands. Keep your heads down everyone!! At 38 / 40 west you can see the item of interest (now recorded by NOAA as Invest 98L) and behind that a wave coming off Africa that is forecast by some models to develop. Anxious days ahead I feel. 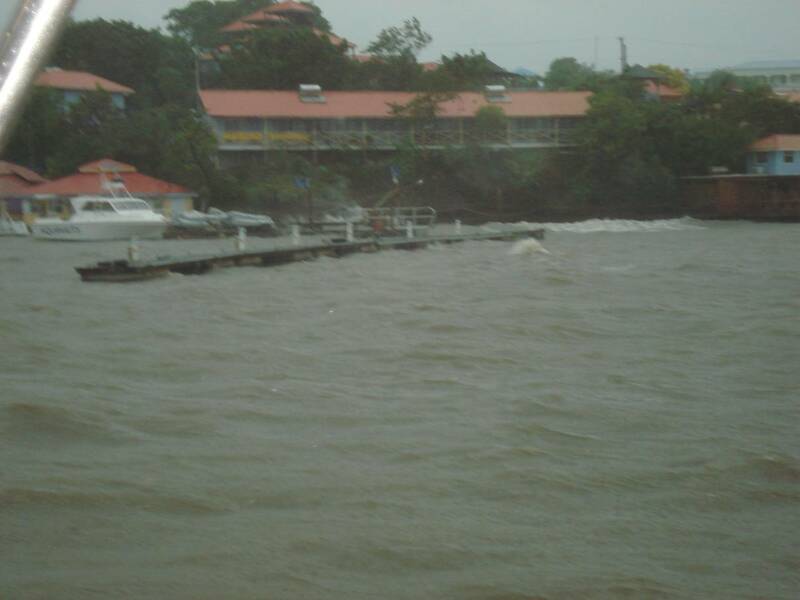 Here in Grenada TS FELIX was certainly expected and we certainly prepared for it as we did with DEAN. I am however wondering if some were not caught slightly off guard as it really was quite unexpectedly intense on the south coast of Grenada early this morning. I am so relieved having read Hogan's post that it was a Tropical Storm going over us, I was of the thinking that if this was a depression thank God it was not a Hurricane. That was a nasty evening with a lull during the night and a very nasty morning to wake up to. I was hoping that when the electric went it was them turning it off which seems to be the case as power came back 15 minutes or so ago. Our C/W mobile received a message saying that the warning was still in place but power would be back on as soon as it was all clear. No damage here from what I can see but have not been in the Village yet. We lost Plantain and my laden Pomegranate took a fair bashing.... lost half the tree. I think nature was having a laugh when this tree was born, a fragile, vulnerable tree with fruit as heavy as any could be. Hoping not too much damage elsewhere on the Island and I also hope it fizzles out.... Take care all. Greetings from Guadeloupe correspondent who has come to “storm free” Grenada in the south!! 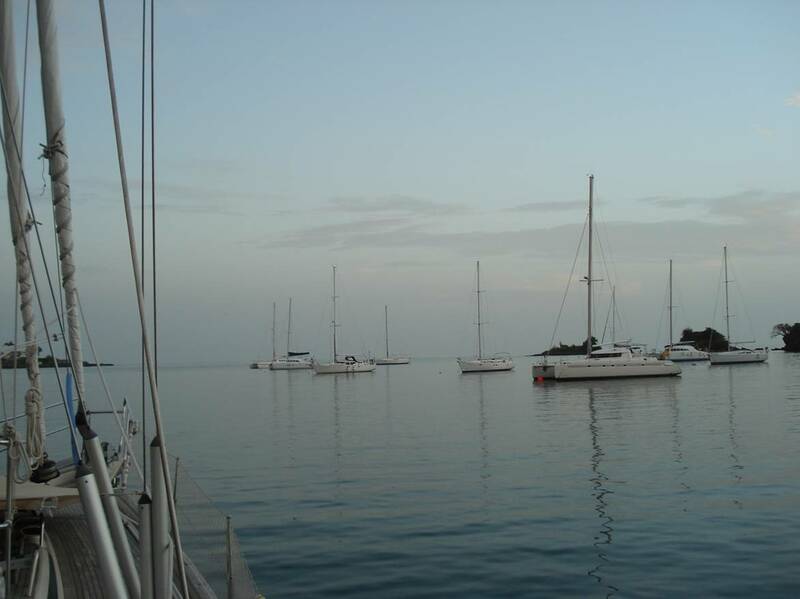 Here are some pictures from my yacht 7.45am in TRUE BLUE BAY where we are on hurricane moorings. The wind picked up at about 3.00am when TS FELIX got going. From 4.00 am we have had 35 kts constant and between 4.30 and 5.30 we had 45 kts gusting to 55 kts. The highest recorded gust was 61 kts on my reliable instrumentation. At this time we have 30– 35kts dropping in the lulls to about 25. 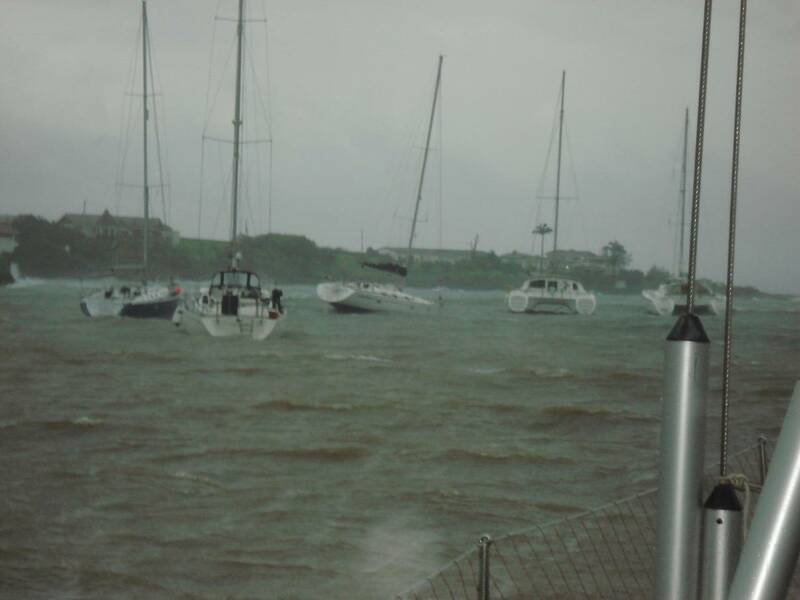 At 5.00 am one 45 ft yacht broke its mooring and ended up hard against the pontoon in the photo in the nasty swell. The yacht’s manager arrived at first light and after a short struggle we managed to secure the vessel back on to a mooring. Nasty storm this but time for coffee and a hot shower as the worst is probably now over!! - Sorry di I call it Trop D. - Now Felix! Felix! Am I being synical? Is it a coincidence that it was named at the same time it hit Grenada, thus the Insurance excess comes into affect? 07:54 the winds slowed for a while, but we just had a very heavy squall. Photo of the sea from here. A bit rough,but could be worse! Woken op from a good sleep about 20 minutes ago. It had been peacful until then. Lights flickering, very windy (I think from the NE)..... Lights just gone out so can't send this now. looks like the middle has gone over us. Roof making an awful noise. And this is only a depression! Wind has eased off somewhat, now from SE. Sea looks quite rough. Roof has (mostly) stopped rattling. Still no power. It went off just as it started to flicker a lot and there were some bright flashes. I guess they turn it off for safety and that after a few checks most will come back on soon. I may start the generator in a while, long enough to send this. Looking around there is no obvious sign of damage, but guess the wind was sufficient to do some minor damage to some roofs. Decided to start generator, just to send this. All the best to everyone and hope 06 fizzles out. gusty and quite strong it's not blowing into the house. 19:25: There is an occasional cool breeze from the NW. Apart from that we have just had a pleasant light display - Lightning, mainly to the NE, a bit of a sunset to the NW and fireflies everywhere. Fairly constant rain, but not too heavy. Going by the NHC prediction the centre of TD6 should pass slightly to the North of us, close to Carriacou, at about 03:00 local. But who can tell, the satelite photos look a bit confused, the centre is hard to find. Keep safe. I am going back to watch the light display. - Wet, some thunder, no breeze. fairly constant rain for the last half hour. There has been some lighning and thunder but not in the last 15 minutes. Wind calm. High overcast in all directions. The rain has eased off since starting this email. Dogs now curled up around my feet until I move and then they will follow me everywhere. Ivan is still fresh with them too. - Tropical Depressions and spiral Galaxies! Grenada this morning has 94L (no TD nmber, yet) less than 300 miles from the Windwards. There is no breeze, but we are getting some heavy showers, with occasional thunder. We appear to be in an outer western arms of the 94L weather disturbance. Looking at the satelite pictures of huricanes, I wonder how many of you have noticed the similarity with spiral galaxies? On a completely different scale, but so similar! Well we now wait to see what this system has in store. It currently seems to be heading straight for Grenada. I have also noticed, since Ivan, all the storms that come across the Atlantic are following a far more southerly course. Is this an affect of Global warming? Although this looks as if it will probably only be a TD or maybe a TS when it gets here, I need to have a tidy up of veranda furniture etc. At the moment I am not considering H. boards at windows, but they are ready. - A beautiful day in paradise. Another fine day in Grenada, nice breeze, plenty of sun, unfortunately no rain today, we could do with the odd shower. But it looks as if we (the southern islands) could be having some rain and strong winds from tomorrow evening. 94L is apparently getting a little more organised. It is just a case of where it will come through the islands. I have seen Tropical Storm being mentioned on one web site. I have been tracking the disturbance for days now and it has followed the track of Emily until a short while ago. It has now crept slightly north of Emilys position at this Longitude, but is close to where Ivan was. But Ivan was a H3 by now and Emily a TS. 94L is now even a TD as I send this. So hopefully only some wind and rain! 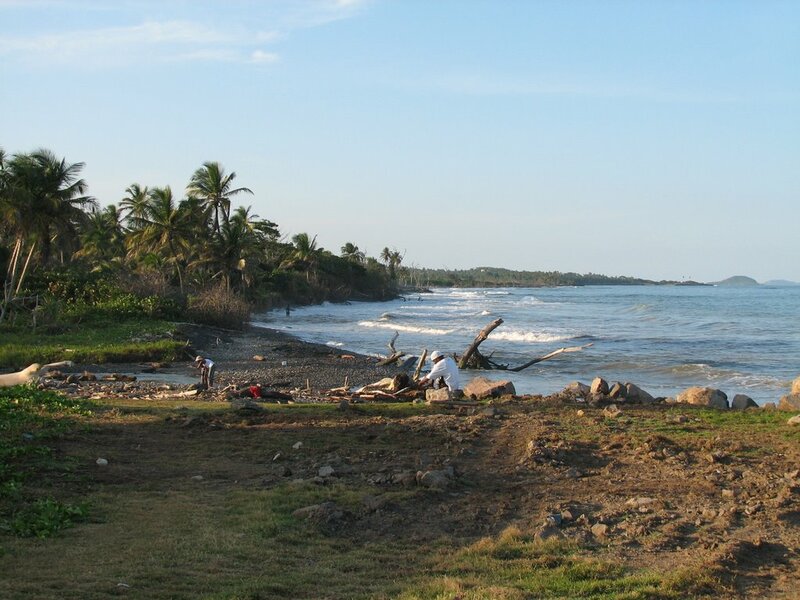 I just read Blayz Brook's post about the 17 fishermen who are stranded on an island 89 miles south of Jamaica, on the Jamaica discussion thread. Someone has asked: How did they come to be there when Dean was bearing down on them? 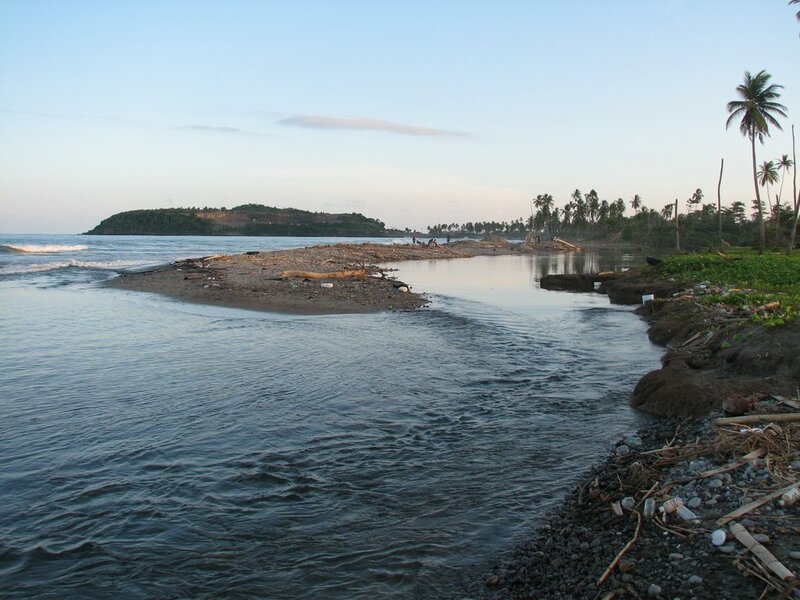 If the fishermen are using an island 89 Miles south of Jamaica, they were likely in a 'camp' there for days so they could bring their boats down and do their fishing one time. They've probably already been there a week - without a television or radio. This would save gas, which as we all know is far too expensive these days, and chances are they were not aware of Dean's approach....let's pray for them and hope that they can break into the military bunker, or survive by gathering under an overturned boat in a depressed piece of land....hopefully in a place that won't have storm surge splashing over them. Well... as mentioned below the passing of Dean did little to affect Grenada but after it passed.... we had thunder, lightening, rain and wind all night long. I'm on the SW of the Island and although the rain and thunder have stopped the wind is still gusting. I saw the trail of weather that was following Dean but didn't think we would feel it quite as much as we did. In fact during the day I even commented that you would never guess that a hurricane was out there so close to us. Nature is a wonderful and terrifying thing I just hope Jamaica and anyone else in it's path is ready for this one. My dogs were grateful that I slept in the chair last night, even the cat was in the house.... hope the goat took good shelter. After 24 hours of the 'calm of the storm' there are winds in Grenada now, coupled with fast moving broken clouds and lots of lightning. The first little breeze blew around 9pm, and over the last hour and a half the wind has progressed from light intermittent breezes to sustained winds and stronger gusts. It only seems to be sustained in the vicinty of 25 kt or so, but the wind is getting steadily stronger, and the gusts are turning into some notable 'knock things over' kind of gusts (I am on a mountain ridge, so the winds will be stronger up here than closer to the Ocean). I find it quite interesting to note that being closer to Category 2 Dean in the South East quadrant had no wind, while the far edge of the South East quadrant of Category 4 Dean (which is much further away than it was last nite) is bringing winds to the outer-most reaches of the system. I certainly feel for the mothers of Grenada this evening as so many children are still traumatized by Ivan and Emily...I have heard so many parents tell me their kids can't sleep well when the wind blows in the dry season, let alone the night after a hurricane passed so close. Ivan was a wind storm with no rain, so I imagine there'll be a lot of tired families tomorrow. My heart goes out to those closer, I am feeling it with you.... stay safe. - Woke up at 06:00 to calm! First - all my best to those in Dominica, St Lucia and especially Martinique. Looking at the satelite photos, Martinique would have just gone through the Eye about the time I write this. I guess they will not be in a state to be looking at the web. Here, at 06:00 it was calm and overcast. 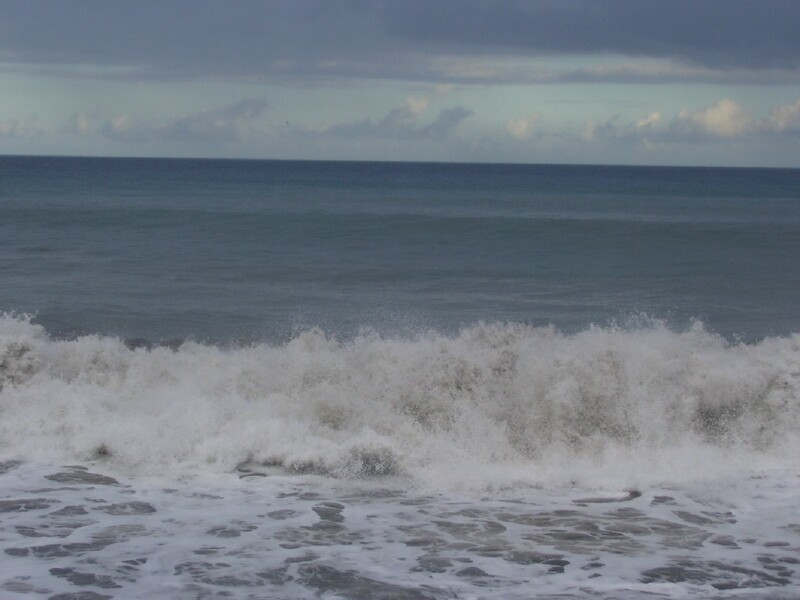 the sea was smooth, yet there were large waves breaking on the shore about half a mile away. The noise of them in the otherwise peaceful, calm morning. Now at 06:52 there is a pleasant stiff breeze starting, from the West. This I expect to fairly rapidly swing round through SW, S to SE, maybe picking up a bit. Hope we hear from the three islands above, very soon. - Trade wind has dropped, rain showers and some thunder. We have had the odd clap of thunder and are now having steady drizzle. The trade winds have stopped. Looking at the latest satelite photo, Grenada is in the extreme southwestern spiral arm of Dean. I notice that most of the airport weather stations are beginning to show a drop in preasure, with Barbados leading, as would be expected. Boats are starting to come into the hurricane bays on the South Coast, but not as many as I have seen before. From Grenada, can we wish all of you in Martinique and Dominica all the very best over the next 36 hours. Du Grenada, pouvons nous souhaitons tout le toi Martinique et Dominica tout meilleur au cours des 36 heures suivantes. (Google translate, not my French). One clash of thunder and the dogs are at my feet, in my lap in the case of one of them. We now have rain and a gentle breeze. The radio is giving out notices quite regularly and advising the use of shelters for anyone that needs them. There are still those that think.... just another storm. - Dean - about 600 miles away. Yesterday afternoon (Wednesday) a beautiful day. The visibility was very good, we could see very large oil tankers on the horizon. Today, again a very nice morning, but it is very hazy, only a few miles visibility, but we still have a decent breeze. Looking at the satelite photos we are just at the very edge of the influence of Dean. I guess the first indication of its passing will be a dropping of the wind, as it counteracts the trade winds, then a change of wind direction from the N. or West. Barbados will be the first to get signs of its approach. All the best to everyone in the Eastern Caribbean over the next 24-48 hours. And the rest of you as it progresses. I'm new to this and can't make intelligent comments about what's happening out there but I can tell you that those I have come into contact with in Grenada are taking this storm seriously. As the morning wore on more people where shopping for provisions and preparing in case Dean came too close to us. The news has kept people informed from early on and it appears we have learned our lesson all be it the hard way. I'm with Amy from Aruba, the 'I' word does seem to keep cropping up. Grenada learnt many lessons from Ivan and a year later Emily, and whilst nobody wishes a hurricane on anyone we at least feel that here in Grenada we are better prepared than we ever were before. 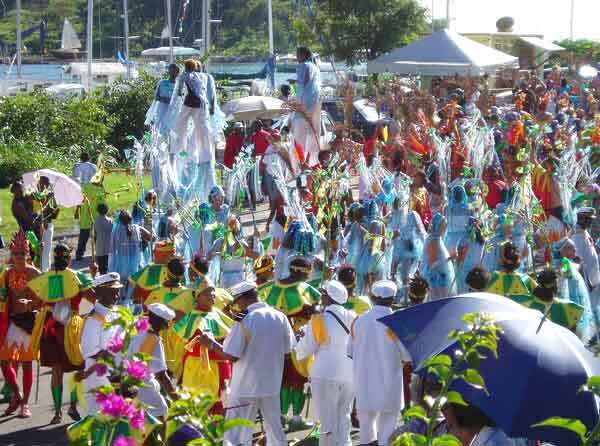 So with an eye on Dean in the distance Grenada enjoyed a great Carnival this weekend through Tuesday and this morning we hope that Dean finds a path that leaves our neighbours untouched. - 04L Four it is! Beautiful day here in Grenada, after a wet and overcast day yesterday. I tried to look at the Persieds metor shower yesterday and about 22:30, the skies had cleared, but ther was some hazy high cloud that spoit the view abit. Watched for 20 minutes and saw two 'shooting stars, only one of which was from the Persieds, so gave up and went to bed. The Mr Blobby has now become 04L Four. at 12N (directly in line with Grenada) and 30W. Now we are starting to move loose stuf in the garden. Tidy under the pool deck so there is room for sun loungers etc. Unfortunately the pool is empty at the moment (due to repairs), I prefer having water in it if there is a hurricane. The predictions for Ivan showed it going North, at first safely into the Atlantic, but it never went North, it just kept coming West. I don't wish another Ivan on anyone, but Grenada has only just got itself back after Ivan. Please we don't want another one. We lost some of our roof in Ivan. Emily rattled it, but nothing lost. But we can't be sure if it has been weakened. Weather boards ready for the windows. Food and water stocks in. Petrol (yep I am from the UK) stocked up. Must get some batteries for torches, and test the generator. And must get some phone cards. Trouble is iit is a two day holiday here! All the best to all over the next few days. Well we have registered over 2" of rain so far today on my new rain gauge. Actually after only getting half an inch of rain ever since installing it some 2 weeks ago it's nice to see it put to the test and looking at the satellite images - plenty more to come. Well, as I expected, a very calm night. No breeze, and none of the storms came our way. This morning is very calm. So I thought I would look at various airport weather conditions. The view from here at 07:30 is bright sun, a few clouds, some touching the tops of the hills, the sea is very calm. 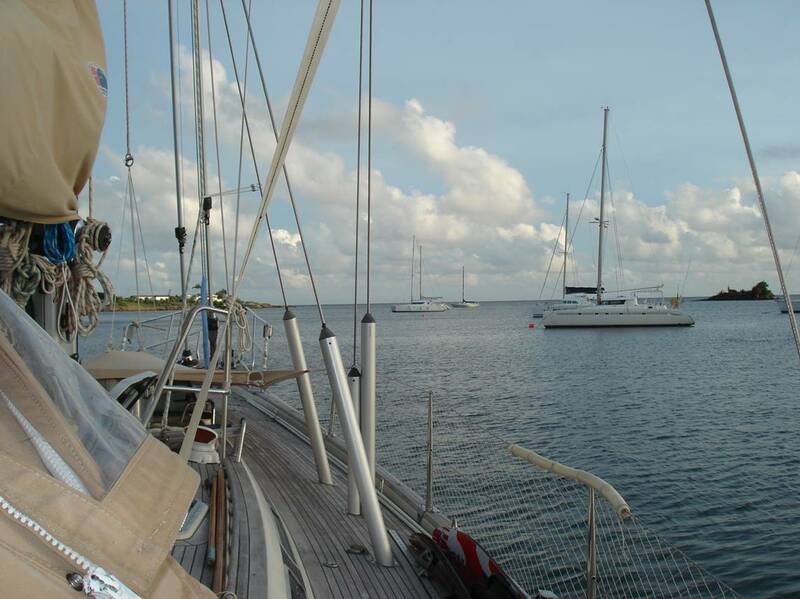 The yachts in the harbour are swinging through all compass points on their anchors. I was going sailing today, but there seems no point. - Hot, sticky, no breeze, lightning & thunder to the south east. We have had no breeze to talk of. Sitting on the veranda with friends and we were all too hot. As soon as it got dark we could see lightning to the SE and as I send this (20:30) we can hear thuder in the distance. Going to be a warm night by the looks of it. Looking at reports from Barbados (180 miles away) it seems the same there. Also the weather in St Vincent (50 miles N) seems somewhat similar. Where are the trade winds? I thought I was in the Windward Islands, what wind? We have no A/C, just rely on the breeze. One sleepless night coming up, I think. The storm to the SE seems to have fizzled out. - Overcast with odd showers. The day here is ending completely overcast, with a few showers visible out at sea (South). 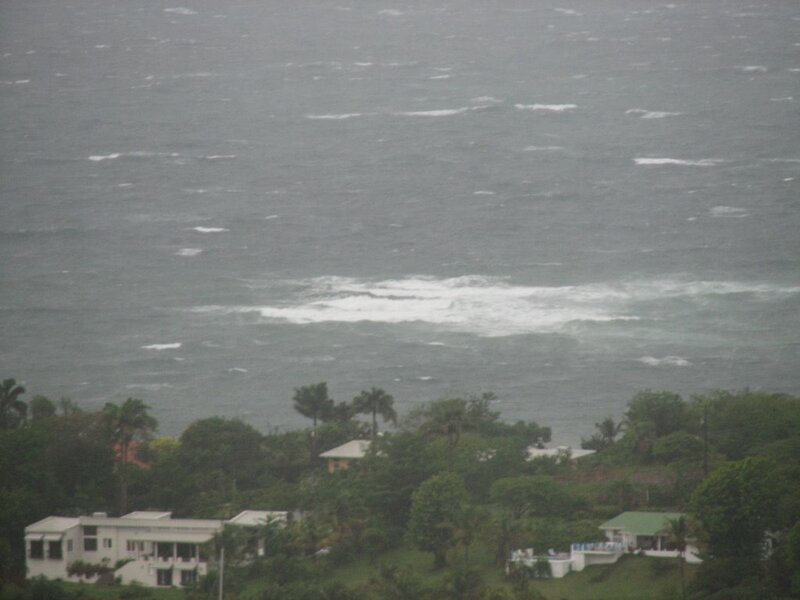 It appears to be a part of a small wave stretching out through Tobago and moving this way. 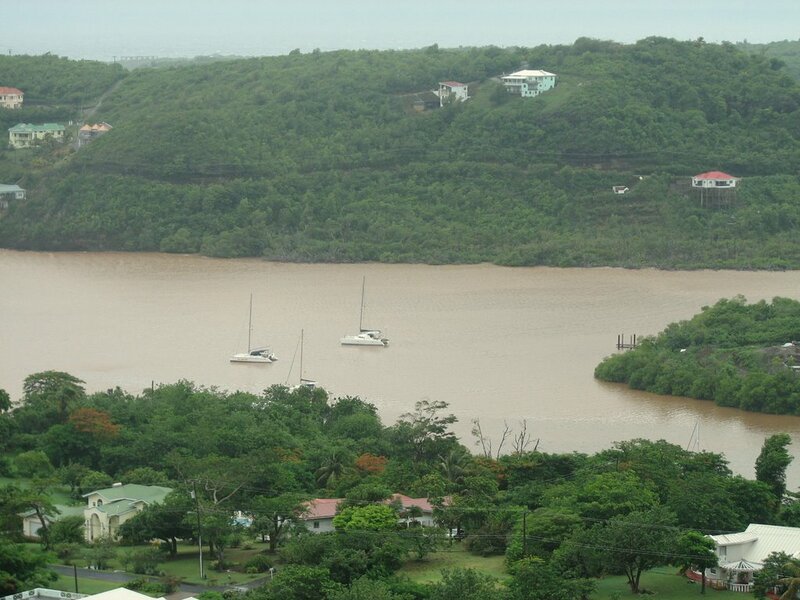 Tobago seems to have gad some rain, with luck we will get some overnight. Slight breeze from ESE. - 99L passed Grenada with just a wimper. Looking at the various weather station reports for yesterday, we see that Barbados hit 30 mph winds, these winds dropped as the wave passed through the island chain. We had some rain and thunder up in the mountains, but here in the South it remained dry, apart from a few spits. Looking at the satellite images this morning shows 99L has regrouped to the West of the Windwards, and looks quite impressive. And I notice that it has its 99L invest classification back having lost it for a while yesterday. This morning it is mainly cloudy in the south of Grenada, but quiet sunny out to the South, although from our vantage point on a ridge, 200 ft up, I can see a long street of showers stretching in an ESE direction for about 5 mile out to sea. Also out to the East there are more showers visible. The tops of the hills are shrouded in cloud. Point Saline airport weather gives the Dew Point at 77F(25C), this relatively high Due point brings the cloud base quite low. - 99L only 240 miles away! We had some much needed rain early this morning, several showers passed through. Behind these showers are the remnants of 99L. At 06:00 this morning, the centre of the depression seems to be 240 miles due east of Grenada and about 70 miles SE of Barbados. Looks like heavy showers could hit Barbados in the next few hours and Grenada possibly later this afternoon, although its path over the last 24 hours seems to be taking it slightly north of grenada. Hopefully it will just give us some rain. The rain has stopped and there is a hazy sun amongst the clouds. Very little wind. All the best to all f you. The main thing about the weather in Grenada today was the lack of wind. Where have the trade winds gone? Tonight is still. Perhaps I should not be asking where the wind is, because it could be only a few hundred miles just south of East of Grenada. 99L has just been designated. Only 1009mb and has some swirl attached. But some experts feel it will fizzle out as it meets drier air. Lets hope so, but maybe it could bring just a little well needed rain. Went sailing today, well boating would be a better description. No wind, becalmed. Gave up and came back into St Georges. Lets have a look at 99L tomorrow! - Some rain,and very little sunshine. Well we arrived back from the UK yesterday. Had two months of temperatures not exceeding 22C, so have come back for some sun. Only we seem to have brought the rain! Having arrived back we notice that Grenada is greener than we expected. It seems there has been some rain here. The garden has suffered from the drought, but most plants, and all the weeds, seem to be recovering. We must get down to planting now soon. Over night there was some lightning to the South (no thunder). Suffering from Jet lag I sat out on the veranda and watched it. This morning we had a band of rain go through with some distant thunder, which now seems to be in the St Lucia area and, according to the satelite pictures, moving north but seems to be dispersing. Some more disturbed weather to the SE. but doesn't look too bad. Current weather at 15:00 slight breeze from ESE 12mph, recent rain shower, but no more in sight, mostly overcast, with the odd hazy sunshine, temperature 29C (84F). Now I must do some weeding. Today has seen steadily increasing winds and the sea is covered with white horses as far as the eye can see. The sky is still blue and the tropical wave and invest 96L seem to be holding out there on the horizon - maybe it will arrive before dark hopefully with no more than a few thunderstorms to light the night sky as it passes. - Is that rain I see in Grenada? This is a bit of a remote weather observation. Currently my wife and I are in the UK. But looking at the airport weather information, it appears that Grenada had a few hours of showers, mostly light, overnight. Only yesterday morning my wife woke up, and woke me up, saying 'I can hear the plants are crying for water'! Well hopefully they have had some, every little helps. Looking at the weather satellite pictures I notice that the heavy clouds over South America are moving further north each day, and there is a huge blob out to the SE of T&T which seems to be spreading. 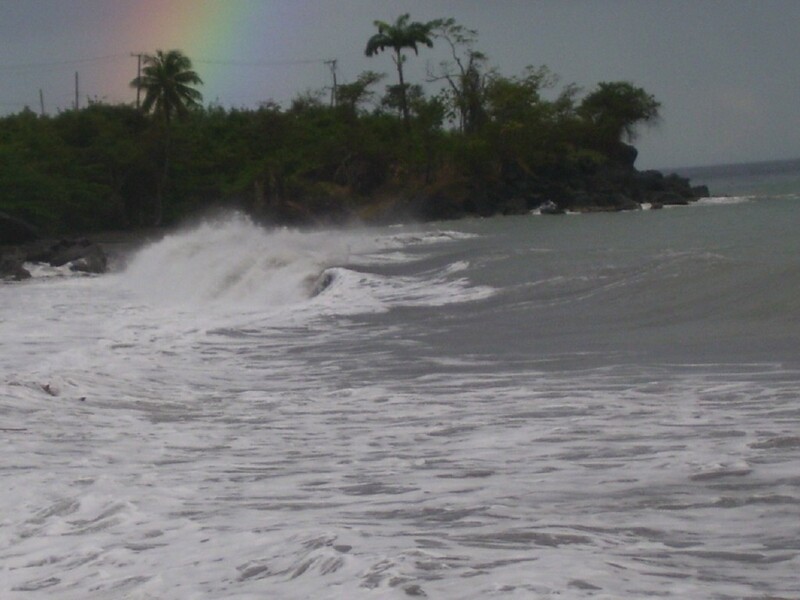 Hopefully Grenada will get some more rain in the next few days. But we don't want too much at first as the very dry soil will wash away. We are looking at the islands North of us getting some rain, but we in Grenada are getting good brisk winds - ideal for Kite Surfers but no sign of any significant rainfall.....so once again it's out with the sprinklers this evening, drinking a cold Carib whilst we plan for another great days sailing in glorious unrelenting sunshine. - The rain on 27th April was a tease. First I will introduce myself. I am Hogan of Grenada. My wife and I have lived in Grenada, in the South at Westerhall, for about 3 years. 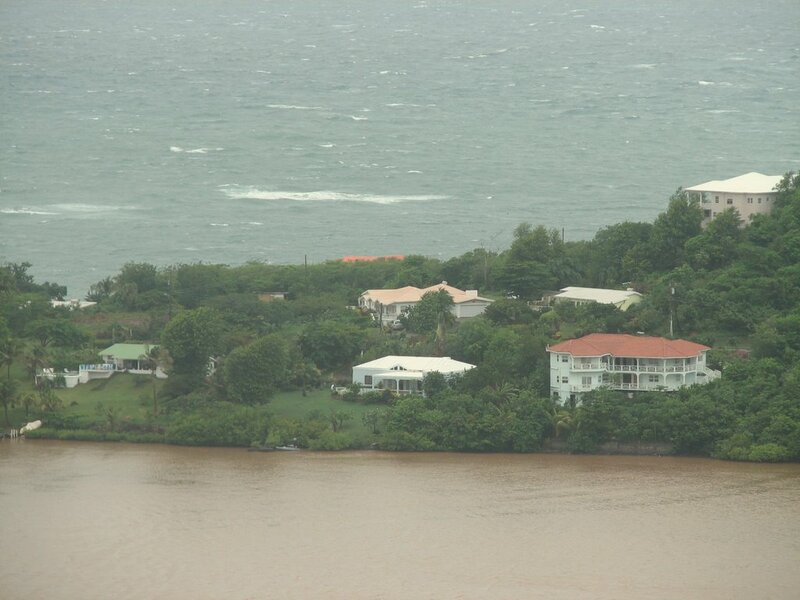 We have a house on a 200ft highridge, overlooking the some of the many inlets on the south coast of Grenada. I am originally from UK, and now retired. 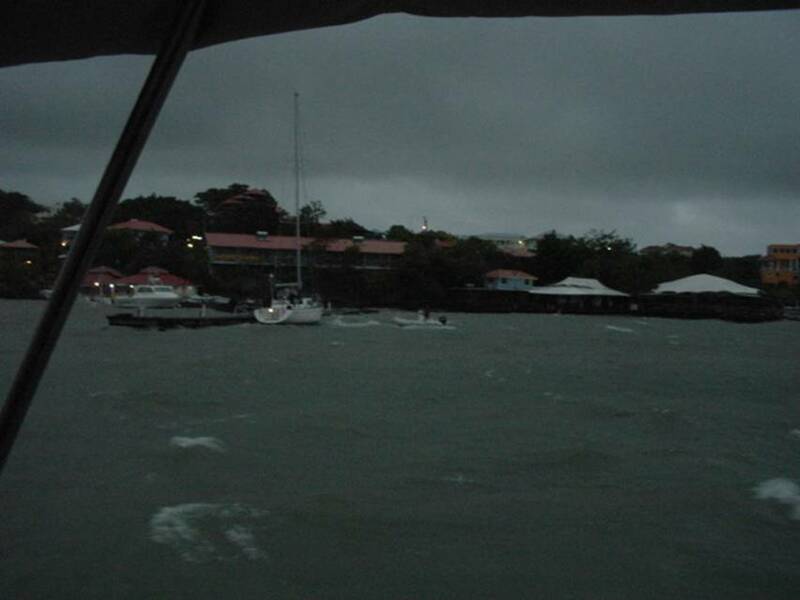 The last entry for Grenada was from Mark and Jill, 27th April, when they stated, correctly, that we had rain. Unfortunatel, it was sent to tease us. The weather returned to dry, with the normal NE trade winds after the few showers on. The plants need rain urgently. Another interesting thing about the 27th April was, for one day only, it brought very very clear skys which allowed us to see the tops of mountains on the North coast of Venezuela. A first for me. My calculations said we shouldn't be able to see them. Any experts opinions are welcome. Our height is 200ft, the distance is 90 miles, the higest mountains (in the range) are just above 3000ft. All the best to all of you for the season ahead.